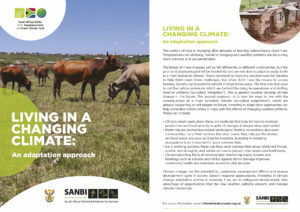 Home » Biodiversity » Science into policy/action » Climate Funds » What is Climate Change Adaptation? The world’s climate is changing after decades of burning carbon-heavy fossil fuels. Temperatures are climbing, rainfall is changing and weather patterns are becoming more extreme and less predictable. Climate-smart agriculture: these are methods that help farmers to maintain production and food security in spite of changes in temperature and rainfall. Restoring and protecting natural landscapes: healthy ecosystems give poor communities many ‘free’ services like clean water, they help put the brakes on flood water, and give grazing for livestock. Investing in restoring ecosystems is an investment in poor communities. Early warning systems: these can help warn communities about imminent floods, storms and droughts, and advise on how to protect their assets and livelihoods. Climate-proofing the built environment: reinforcing roads, houses and buildings such as schools and clinics against storm damage improves community health and maintains access to vital services. Climate-resilient livelihoods: these allow people to make a living in such a way that they are able to cope with, and recover from, the effects of sudden or slow-onset changes in weather patterns. Climate change has the potential to undermine development efforts and reverse development gains if society doesn’t respond appropriately. Investing in climate change adaptation actions is essential if we are to safeguard development, take advantage of opportunities that the new weather patterns present, and manage climate-related risk. Climate change will redraw the agricultural map of the country. Rising temperatures and shifting rainfall patterns will impact on yields, and change what crops and animals are farmed, and where. 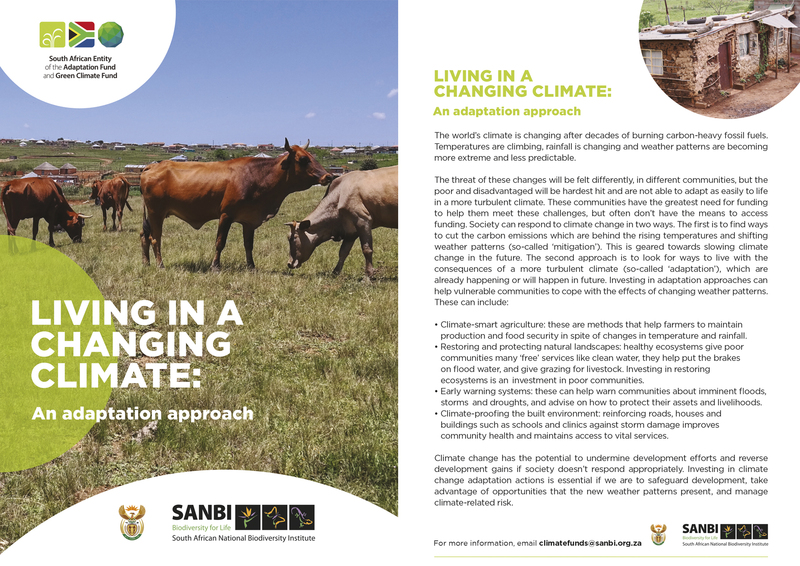 Because many communities in South Africa depend on agriculture for their livelihoods, a changing climate will have wide-reaching impacts. Building the ability of farmers to cope with the effects of changing weather patterns is essential for safeguarding food security, livelihoods and development in a climate-altered future. 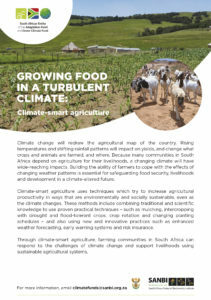 Climate-smart agriculture uses techniques which try to increase agricultural productivity in ways that are environmentally and socially sustainable, even as the climate changes. These methods include combining traditional and scientific knowledge to use proven practical techniques – such as mulching, intercropping with drought and flood-tolerant crops, crop rotation and changing planting schedules – and also using new and innovative practices such as enhanced weather forecasting, early warning systems and risk insurance. 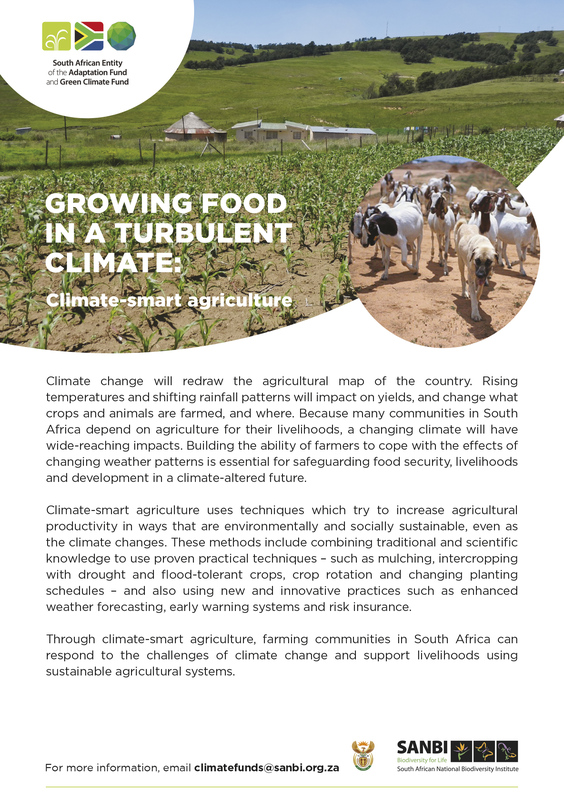 Through climate-smart agriculture, farming communities in South Africa can respond to the challenges of climate change and support livelihoods using sustainable agricultural systems. 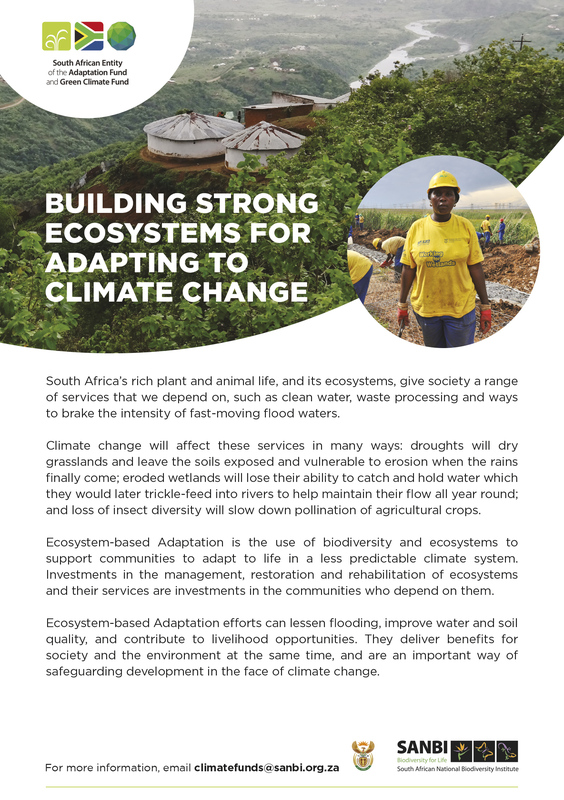 South Africa’s rich plant and animal life, and its ecosystems, give society a range of services that we depend on, such as clean water, waste processing and ways to brake the intensity of fast-moving flood waters. Climate change will affect these services in many ways: droughts will dry grasslands and leave the soils exposed and vulnerable to erosion when the rains finally come; eroded wetlands will lose their ability to catch and hold water which they would later trickle-feed into rivers to help maintain their flow all year round; and loss of insect diversity will slow down pollination of agricultural crops. Ecosystem-based Adaptation is the use of biodiversity and ecosystems to support communities to adapt to life in a less predictable climate system. Investments in the management, restoration and rehabilitation of ecosystems and their services are investments in the communities who depend on them. In many parts of South Africa, sudden and slow onset changes in climate patterns are likely to mean an increase in severe weather events, with implications for many sectors of South African Society. Investments in early warning systems can support vulnerable communities to prepare for anticipated changes and in so doing, protect their livelihoods and assets and avoid the loss of life. 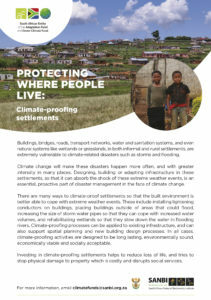 Buildings, bridges, roads, transport networks, water and sanitation systems, and even natural systems like wetlands or grasslands, in both informal and rural settlements, are extremely vulnerable to climate-related disasters such as storms and flooding. Climate change will make these disasters happen more often, and with greater intensity in many places. Designing, building or adapting infrastructure in these settlements, so that it can absorb the shock of these extreme weather events, is an essential, proactive part of disaster management in the face of climate change. There are many ways to climate-proof settlements so that the built environment is better able to cope with extreme weather events. These include installing lightening conductors on buildings, placing buildings outside of areas that could flood, increasing the size of storm water pipes so that they can cope with increased water volumes, and rehabilitating wetlands so that they slow down the water in flooding rivers. Climate-proofing processes can be applied to existing infrastructure, and can also support spatial planning and new building design processes. In all cases, climate-proofing activities are designed to be long lasting, environmentally sound, economically viable and socially acceptable. Investing in climate-proofing settlements helps to reduce loss of life, and tries to stop physical damage to property which is costly and disrupts social services. Poor, rural and disadvantaged communities are more likely to struggle with the environmental shocks that come from weather-related natural disasters. In particular, climate change will have an immediate and measurable impact on the way goods are produced and sold, and on these communities’ ability to make a living. 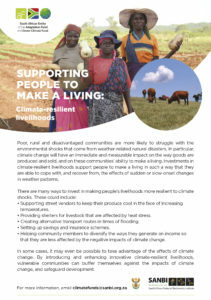 Investments in climate-resilient livelihoods support people to make a living in such a way that they are able to cope with, and recover from, the effects of sudden or slow-onset changes in weather patterns. Supporting street vendors to keep their produce cool in the face of increasing temperatures. Providing shelters for livestock that are affected by heat stress. Creating alternative transport routes in times of flooding. Setting up savings and insurance schemes. Helping community members to diversify the ways they generate an income so that they are less affected by the negative impacts of climate change. In some cases, it may even be possible to take advantage of the effects of climate change. By introducing and enhancing innovative climate-resilient livelihoods, vulnerable communities can buffer themselves against the impacts of climate change, and safeguard development.